Easily free up space on your smartphone2 or quickly transfer files between devices at USB 3.1 high speeds of up to 150MB/s1. With a reversible USB Type-C™ connector and a traditional USB connector, the SanDisk Ultra® Dual Drive USB Type-C™ lets you quickly and easily transfer files between smartphones, tablets and computers. Plus the SanDisk® Memory Zone app for Android™ (available on Google Play™)3 helps you manage your device’s memory and your content. The SanDisk Ultra Dual Drive USB Type-C is the perfect liaison between your new USB Type-C device and your devices with traditional USB ports. Designed specifically for next-generation devices with the new USB Type-C port. The reversible connector has a symmetric design, so that it’s always right-side up, making it easy and fast to plug in. High-speed USB 3.1 performance of up to 150MB/s1 means you spend less time waiting to transfer your photos, videos, songs, and other files between devices. 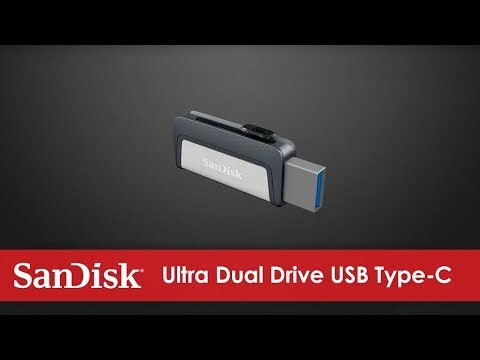 With dual connectors, the SanDisk Ultra Dual Drive USB Type-C lets you free up space on your smartphone or tablet2, or transfer files between multiple devices, whether it has a USB Type-C port or the traditional USB Type-A port. Available from the Google Play™ store, the SanDisk Memory Zone app3 lets you view, access, and back up all the files from your phone's memory in one location. It can also automatically move files from your device to your drive to free up space. Easily free up space or transfer files from your USB Type-C™ smartphones, tablets and computers. The super-thin SanDisk Ultra USB Type-C flash drive is designed specifically for next-generation devices with the new USB Type-C port. Mobile device compatibility Smartphones, tablets, and other host devices with USB Type-C™ ports and On-The-Go (OTG) support. See www.sandisk.com/dualdrive-c for list of compatible devices. 5-year limited warranty. For more information, see the Warranty and User Guide page. 1. 32GB-256GB: Read speeds up to 150MB/s. Write speeds lower and vary by capacity. USB 3.0 or USB Type-C with USB 3.1, Gen. 1/USB 3.0 support required. Based on internal testing; performance may be lower depending upon host device. 1MB=1,000,000 bytes. 16GB: Read speeds up to 130MB/s. Write speeds lower and vary by capacity. USB 3.0 or USB Type-C with USB 3.1, Gen. 1/USB 3.0 support required. Based on internal testing; performance may be lower depending upon host device. 1MB=1,000,000 bytes. 2. Mobile device requires USB Type-C port and On-The-Go (OTG) support. See www.sandisk.com/dualdrive-c for list of compatible devices. 3. Download and installation required.